However, the guidelines don’t stop there. Instead of using their screen time to watch idle television programs and play silly digital games, children and teens should spend their time engaging with quality programming. What constitutes quality programming and where can you find quality programming for your children and teens? We’ve broken it down by age and have provided with some suggestions of quality resources you can feel comfortable allowing your children to interact with. Does the content allow for interaction? What speed does the content move at? The educational component of an app or video is important, but the way it is presented is equally important. In a now infamous study, researchers discovered that shows like Caillou moved at a speed better for young kids’ brains than shows like SpongeBob SquarePants. Content that moves at a fast speed, features bright flashing colors, or loud background music is not ideal for children in this age group. BabyFirst TV offers slow-moving, educational shows for children, including series such as Hide and Seek and Harry the Bunny, which help children build developmental skills. Baby Genius on Netflix features animated characters singing nursery songs mixed in with real-life images. Parents can get involved by singing along and helping young children perform movements along with the songs. Mother Goose Club on Netflix and YouTube also presents nursery rhymes for kids. It features kids in animal costumes, simple animations, and motions for kids to follow. Baby Animals in the Wild on Netflix may seem above the level of kids this age, but they’ll love the relaxing feel, simple descriptions, and slow-moving video. Blue’s Clues moves at a pace appropriate for very young children. It also features characters who talk directly to children and gives them plenty of opportunity to interact. Baby Apps from Fisher-Price feature simple designs and colors designed to appeal to younger kids. In most instances, all kids have to do is tap to get a reaction or move on to the next screen. Kids can also play the games on the computer. The Adventures of Nano Bear is a series of apps designed for babies and toddlers. The apps focus on animals in different habitats and are full of animal sounds, simple animations, and early learning activities. Mochu POP is a language immersion app for babies and toddlers. Kids are instructed to pop balloons with a particular shape or color. As they do, they’re rewarded with positive reinforcement. Every time they tap the bubbles, they’re also introduced to new letter sounds. Metamorphabet takes kids through the alphabet by morphing the letters into fun shapes. Kids begin to build letter recognition and vocabulary skills. When it comes to kids in this age range, you want to choose content that’s designed to enhance their knowledge, not just entertain them. So while shows like Paw Patrol and The Lion Guard may be entertaining, they may not be the best use of kids’ media time. At this age, parents should also focus on interacting with children as they interact with media. Talk to kids about what the characters are doing on a show, what they’re drawing on an app, or what’s going on in a particular game. WordWorld builds kids’ vocabulary skills in a unique way – by transforming words into shapes and placing them into fun stories and animations. Find their videos on PBS, in the App Store, and through Hulu and Amazon. Team Umizoomi teaches kids early math skills, such as measurement and shape recognition, through its fun animated series. The math isn’t just thrown into the show either; it’s often a part of help the characters solve their problem. Daniel Tiger’s Neighborhood is a series for kids that was developed based on characters from Mr. Rogers Neighborhood. The series is designed to help kids learn to recognize their emotions and express themselves in healthy ways. Mighty Machines features narrated videos of real-life trucks and other construction vehicles. Kids who love trucks will be mesmerized and learn something at the same time. KidsTV123 is a YouTube channel full of simple learning videos for young kids. All of the songs are set to tunes that are easy for kids to remember. The Learning Station provides “healthy music for a child’s heart, body, and mind.” The company, which also sells its songs, offers a YouTube page full of fun and educational songs. Many of the songs feature movements that kids can perform as they watch. Tally Tots Counting helps kids learn to count through a series of mini games presented in a relaxing, colorful environment. Endless Alphabet and it’s companion, Endless Reader, help kids learn to read and build their vocabulary skills through a series of animated words and videos. Thinkrolls is a unique app that helps kids build logical thinking skills as they roll their characters through a series of mazes full of STEM-related challenges. Montessori: 1st Operations introduces kids to addition, subtraction, and other mathematical concepts through a series of practice activities designed to let them explore the numbers in their own way. Shiny Things apps help kids develop number sense and learn about following directions through fun activities, such as running a bakery or putting on a circus. At this age, parents should begin to put limits in place to guide how much screen time children should get and what they can and can’t do during their screen time. Parents should still focus on making the screen time educational and/or interactive. For example, a video game like Just Dance might not be educational, but it gets kids up and moving. The Magic School Bus brings the popular children’s book series to life, teaching kids all about different scientific concepts through its animated episodes. Cyberchase invites kids to become detectives and solve math-based mysteries. As they do, they’ll learn that math is all around them. Odd Squad is an educational detective comedy show that’s sure to engage kids. The main characters use math to help them solve problems, with a bit of hilarity and parody thrown in. Master Chef Jr. encourages kids to get into the kitchen by watching and learning from talented kid chefs. Chopped Junior is another good show for kids who are interested in cooking. The Spangler Effect is designed to make science fun and engaging to kids and adults. Steve Spangler creates videos of amazing science experiments. Many kids can do at home. Others are best left to the experts. Crazy Gears challenges kids with a series of puzzles designed to teach them how gears work. Even adults may be stumped as they try to figure out where to place all of the pieces to complete the puzzle. This app builds logical thinking skills. Toontastic allows kids to create their own animated cartoons. With this app, kids can write silly stories, create funny cartoons, or even put factual information into a format that’s more fun to read. Stack the States provides kids with a fun way to learn all about the 50 states. As they play, they’ll learn state capitals, abbreviations, and other important facts. Inventioneers allows kids to create their own crazy adventures. As they do, they learn about engineering and physics. Math Bingo is more than just your basic bingo game. This app combines bingo and math to create a highly engaging and educational app. Kids can play at three levels of difficulty and work with addition, subtraction, multiplication, division, and even mixed operations. As kids hit the tween years, they want to gain a bit of independence. Parents should start giving kids the chance to set some of their own limits, but still keep strict guidelines for what they’re allowed to watch in place. Tweens may want to watch the shows their friends are watching or start to show an interest in content designed for teens and adults. Parents have the job of determining what of that content is suitable based on the child’s maturity level. They may also opt to view content with tweens so they can talk about what’s good or not so good about the content. MythBusters answers some of life’s most-pressing questions through scientific experiments. However, these aren’t experiments for kids to try at home. They’re often large-scale productions that involve dangerous stunts. Horrible Histories makes history interesting by pulling out some of the goriest, craziest, and most entertaining moments from the past. Parents may want to preview episodes to make sure the events they cover are appropriate for kids and teens. Generator Rex is an animated cartoon that is designed to appeal to the tween and teen market. Not only do kids learn a bit about STEM concepts, but they also gain access to a character who faces emotions and struggles they can relate to. The Brain Scoop features discussions on interesting topics, such as how bird vomit helps us understand history. Tweens and teens can learn a lot about science and history through episodes of this YouTube series. React gets reactions from kids, teens, and adults on a variety of topics – some controversial, some nostalgic. The channel helps introduce tweens to different viewpoints, gives them something to laugh about, and spurs them to think about their own thoughts on different issues. SoulPancake is best-known for its Kid President videos, but it also features other series, such as Brick X Brick, which features cool videos about building with LEGOs, and How to find HAPPINESS, a series of videos designed to help people be happier. GeekGurl Diaries is a series of YouTube videos designed to get girls interested in STEM. It features different tech tutorials, interviews with women in tech, and Hour of Code activities. Box Island teaches kids about coding by having them use the principles of coding to solve a series of challenges and make their way through the app. DIY App offers a creative community where kids can learn how to do virtually anything (that’s kid appropriate). Through tutorials, kids can learn to put on makeup, create an app, knit a sweater, or even cook a gourmet meal. Questimate encourages kids to be curious by giving them the opportunity to create their own questions and estimate the answer. For example, how many jelly beans would be as long as a skateboard? Monster Physics features a series of challenges that kids must solve. This game, which is also entertaining for adults, helps kids learn about the basics of physics. Geography Drive USA helps kids and tweens learn all about US Geography through a series of trivia challenges. Angry Birds is an app that is both fun and educational. Tweens can download different versions of the game, such as Angry Birds Star Wars and Angry Birds Epic. Whichever version they play, they’ll build logical thinking skills and learn a bit about physics as they use the birds to try and take out the pigs. Parents should note that Angry Birds does allow social media access and have in-app purchases, so they should be sure to set up devices to prevent access to these areas. Teens should be allowed some independence to explore media on their own and determine what amount of media use is okay for them. However, parents should still set some guidelines, such as making the dinner table a media free zone or not allowing teens to have their devices in their bedrooms at night. Parents should also regularly talk to teens about their media use, monitor the content they have on their devices, and step in when they think teens are misusing their devices or spending too much time engaging in media. Good Eats helps viewers learn the science behind the foods that they’re making. Hosted by Alton Brown, the show combines humor with facts to make for a truly engaging program. Cosmos: A Spacetime Odyssey takes viewers on a journey through the cosmos to help them better understand the universe we live in. Brain Games gives viewers a chance to exercise their brains through a series of mind-stretching games and puzzles. Drive Thru History takes viewers through history to help them learn more about events that shaped the world. The show has a Christian focus, but offers a great overview of ancient civilization. How It’s Made goes behind the scenes to show how different products are made. For example, have you ever wondered how they make a hockey puck or what the components of a high-voltage circuit breaker are? CrashCourse gives teens and adults a chance to quickly learn about a variety of topics related to physics, philosophy, government, economics, literature and more. The videos aren’t just educational either, they’re also a lot of fun to watch. DuoLingo features bite-sized language learning exercises that help teens learn a new language or improve their language skills. Users can choose a range of practice opportunities, from 5-20 minutes a day. DragonBox Algebra 12+ helps make math more interesting to teens by giving them a fun way to solve advanced algebra concepts. Presidents vs. Aliens teaches teens all about presidents and history through a unique game that pits the presidents against evil aliens. MindSnacks uses fun games and cute characters to help teens learn a new language. This question is especially important when it comes to apps, websites, and online videos. For apps, avoid content that allows unprotected social media access or gives kids the opportunity to interact with people they don’t know. Even if an app or website says other users are kids, there’s no guarantee. Some video sites and apps may seem age-appropriate, but quickly lead to less appropriate videos. For example, kids watching videos on YouTube unsupervised may inadvertently gain access to less appropriate content, even when using YouTube’s kids filters. Older kids and teens may want to watch popular television shows and movies (“because all my friends are watching it”), but not all of them contain content appropriate for kids. For example, a child in late elementary or early middle school may not be ready for The Walking Dead. Does it promote good habits? Pay attention to the behavior of the characters in the programming your child are engaged with. For example, some parents of preschoolers don’t let their children watch Caillou because they feel like he whines too much. If you want your young child to learn manners and respect, choose shows with characters who reflect that. If you don’t want your tween to date, don’t let him/her watch a show where the main characters focus on dating relationships. Are your kids able to interact with it in a healthy manner? At the end of the day, whatever content kids interact with, they need to learn how to engage with that content in a healthy manner. If you find it hard to pull your child away from a television show or app or if you find your child spending too much time fixated on a particular app or program, it may be time to take a break from that content and set some limits on future use. To help you manage your children’s screen time, the American Academy of Pediatrics offers a Family Media Plan creator and a Media Time Calculator. 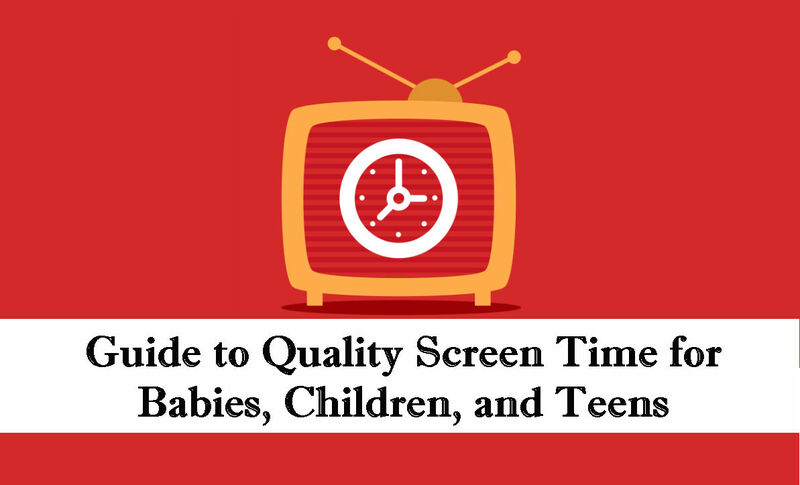 These resources are free and can be customized by age level to help you manage your children’s screen time effectively. For more educational media, check out our Ultimate Guide to Free Online Self-Learning for Kids and Top 100 Free Educational Sites. Do you have tips to help parents manage their children’s screen time or quality programming recommendations? If so, share them in the comments.